Hanoi (VNA) - The International Finance Corporation (IFC) – a sister organisation of the World Bank and member of the World Bank Group - and the Orient Commercial Bank (OCB) on March 27 signed a cooperation deal on a 100 million USD credit package and a consultancy programme to promote supply chain financing. Under the agreement, IFC will provide a loan worth 100 million USD to the OCB with a term of three years, including 57.16 million USD from IFC’s own account and 42.84 million USD from the multi-investor Managed Co-Lending Portfolio Programme (MCPP) managed by IFC. The IFC-led financing package, combined with advisory services, will boost lending to small- and medium-sized enterprises (SMEs), especially women-owned or managed, and will promote supply chain finance in Vietnam. Comprising 98 percent of Vietnam’s total enterprises, SMEs are the primary engine of job creation in the country, employing more than half of the labour force and contributing about 40 percent to gross domestic product. Yet, some 60 percent of SMEs have unmet financing needs, creating a 21 billion USD financing gap. Access to finance is key to unlock the potential of SMEs, according to IFC. Speaking at the signing ceremony, OCB General Director Nguyen Dinh Tung said the bank sees SMEs as an important target segment to realise its strategy to become a leading retail and SME bank in Vietnam. “IFC’s financing package helps reinforce the bank’s continued commitment to expanding lending to this segment, enabling SMEs to further grow and improve their performance in the context of increased competition,” he added. 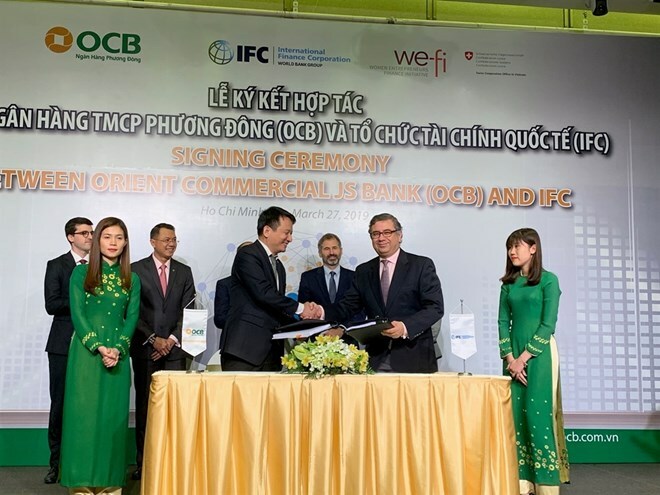 In addition to funding, in partnership with the Swiss State Secretariat for Economic Affairs, IFC will help OCB develop its supply chain finance business. While Vietnam is an export driven economy, few local banks offer a full range of supply-chain financial services to smaller businesses. With IFC’s support, OCB will develop a supply chain finance electronic platform to support the financing of commercial transactions. “This financing package with its large mobilisation component is expected to have a catalytic impact for gender finance in the Vietnamese banking sector, which is at a critical juncture of mobilising long-term private funding to support the country’s crucial goals of developing SMEs and accelerating economic growth,” said Vivek Pathak, IFC Regional Director for East Asia and the Pacific.